Patients with severe skull injuries can have their bone structure imaged and have a custom implant 3d printed that fits perfectly with their existing bone structure. 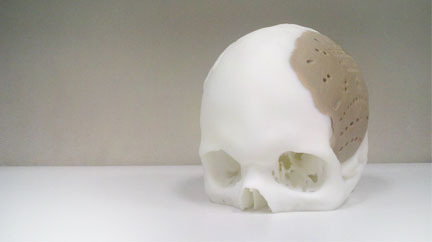 The FDA has just approved the 3d printed skull implants from Oxford Performance Materials. The company uses a CT Scan or MRI to create a model of the patient’s skull, then designs an implant that fits any gaps. The implant is 3d printed with the special material that is biocompatible to reduce rejection. The surface should support cell attachment including bone cells. As the bone around it heals, the implant will become an integrated part of the patient’s bone structure. The PEKK material, under trade name OXPEKK-IG, is usable for other non-load bearing bones as well, so facial, jaw, hand, and feet bones could all be candidates for a custom 3d printed replacement. If a pianist wanted longer fingers so they could play Lizst more effectively, they could scan their hand and replace some of their bones with slightly longer ones. People who want more animal faces could modify their facial structure. The opening of the new 3d printing book Fabricated explores a future where it’s possible to get a full body scan, so in emergencies you could get a new body part 3d printed. This announcement brings us a little closer to that reality.